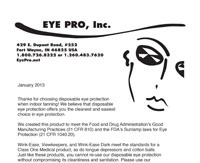 Salon Tips | Eye Pro, Inc.
Want to increase your eyewear sales? 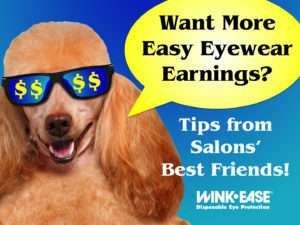 Click on any of the salon tips links below from the EYE PRO Eyewear Experts! Click here to take our award-winning training! 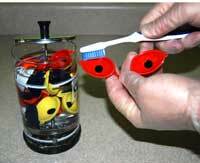 Make the switch to selling eyewear instead of cleaning it! Click here to download our popular guide to switching. Click here to download the steps required by law for proper sanitation. 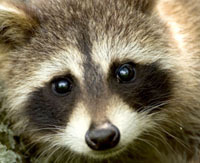 Click here to download some easy ways to overcome eyewear objections! 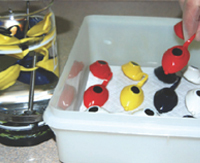 Can your staff/tanners answer 9 basic questions about eye protection? We don’t think so! 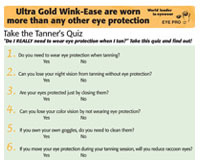 Click here to download the Tanners’ Quiz and find out how they do. Click here to download Total Tan’s comprehensive checklist to see how your salon stacks up to a spotless salon! Click here to download our letter explaining this to your tanners so they don’t re-use Ultra Gold WINK-EASE or Lash Room WINK-EASE.